By request I'm posting pertinent links to Yurt information. Here's where I got started. Barefoot in West Virginia (by god). His FAQ here. Be sure to check out his PV setup. SCA Mongolian Yurt Part 1 PDF. 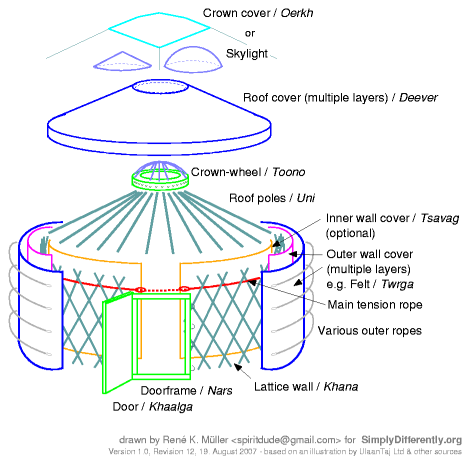 SCA mongolian Yurt Part 2 PDF. Yurt Building - Documents the complete process of building a yurt from raw materials in pictures and text. Good FAQ. The Tent Lady on Instructables. Building a new 20 foot gertee. GerTee - Portable tent home made of recycled materials. My own post's on yurts. Now if Your handy and have at least a few tools, You are on Your way. Enjoy.